Even though I own several less-portable consoles, lately I’ve found myself spending more of my gaming time on the 3DS than the Wii, PS3, or Xbox 360. In fact, even though I recently purchased Grand Theft Auto V I haven’t touched it. The 3DS has occupied an interesting amount of free time; something that is rare these days. While away on a work trip I was itching to pickup a new game for my Nintendo 3DS. 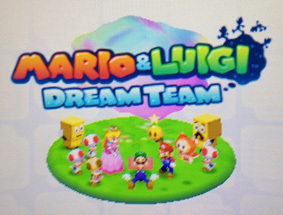 I had viewed some of the demo videos and read a few, positive snippets about Mario & Luigi: Dream Team so one night I purchased and downloaded the game via the Nintendo eShop on the 3DS. I’ve found this game to be more addictive than anything else I’ve played in a while. The mechanics are somewhat similar to Paper Mario: Sticker Star. It’s a combination of RPG and action gameplay and many of the battles boil down to using certain items, moves, and (mostly) perfect timing. That being said, it’s also very different from Sticker Star in many ways. As far as I can tell this is a much larger game. The Short Version: Someone unfamiliar with the Pilotwings series might enjoy it more than those who have played the SNES and N64 versions. I think it’s overpriced at $40 but it’s not a bad game if you can get it for about $20. Back in the days, when the SNES was still relatively new, one my favorite games was Pilotwings. The 3-D like graphics were high-tech (for a console) at the time and I was also somewhat fond of flight simulators. It combined a handful of different skills and craft: piloting a plane, jet pack, hang glider, and skydiving. The final level involved a mission that required piloting a military helicopter to take out various targets. I never played the Pilotwings version for the N64 very much, but from what little I did play it seemed like a fun game (I especially had fun with the cannons). I couldn’t resist purchasing the 3DS edition of Pilotwings. Surely, it would be at least as good as the original Pilotwings, right? One day I went up to Wal-Mart with intention of buying a copy there but when I saw the price of $40 I decided to look on Amazon.com again because I thought I had seen it for less. Sure enough, it was sold for less than $20. I ordered a copy from Amazon while I was standing in front of the games at Wal-Mart (I already had Amazon Prime so I had 2-day shipping for no extra charge). It turns out that Pilotwings Resort wasn’t quite the game I was expecting. Now, it’s not a bad game. In fact, if you’ve never played the Pilotwings series you might enjoy it more than I did. After all, I already had expectations for the game to live up to. In my opinion it’s a mediocre game. I was expecting it to be a combination of the original SNES version and the N64 version, but it’s not. It is very similar to the SNES version with some additional craft and challenges, but as far as I can tell (I haven’t reached the final section) it’s missing the more fun elements from the N64 version. I don’t think it’s worth $40. But it’s an OK game at $20.